The SPOT (Satellite Pour l'Observation de la Terre, "Earth Observation Satellite") programme was initiated by France in the 1970s and came to fruition in February 1986 when five satellites equipped with high resolution imaging equipment were put into orbit. The last in the series, SPOT 5, was put into orbit on 4 May 2002 from the launch base at Kourou by an Ariane 4 launcher (model 42P, flight 151). SPOT 5 is 5.7 m tall on a base with 3.1 m sides; its launch weight was 3000 kg including 150 kg of hydrazine. The planned service life was 5 years. All the SPOT satellites orbit at an altitude of 820 km, in quasi polar orbits, with an inclination of 98.7° (which allows sun-synchronism). The period of revolution of the SPOT satellites is 101.4 min. and an orbital cycle lasts 26 days. These orbital characteristics impact the acquisition of images and their subsequent interpretation. The instrumentation on board has evolved with the different satellites with the main objective of obtaining increasingly powerful high resolution imaging. All the SPOT satellites are equipped with twinned cameras with a 5 to 20 m resolution in the visible and infrared regions of the spectrum depending on the operating mode. 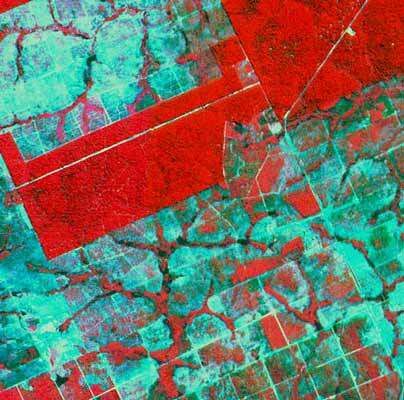 The SPOT 4 and 5 satellites also have a "vegetation instrument" operating in 4 spectral bands to cover almost all land surface with a spatial resolution of the order of a kilometre every day. SPOT 5 also has an instrument for stereoscopic imaging. Many products are created using the measurements made by the sensors on board the SPOT satellites. The SPOT IMAGE business is in charge of the marketing of these products at various levels of processing, in photographic or digital form. Amongst the most common products coloured SPOT image composites are the most well known. These are usually the result of a combination of data from three channels in the green, red and near infrared spectra.